This year marked Eric Clapton’s 70th birthday, a milestone that is celebrated on this recent career-spanning compilation focusing on Slowhand’s output for Warner Bros./Reprise Records. What makes this set stand out from the previous greatest hits albums is that it is divided between studio cuts and live performances (a third disc on a special deluxe edition features blues material). Familiar favorites from the Warner years trace Clapton’s progression from guitar/blues rock hero to mainstream pop performer that started from the ’70s and continued onto the ’80s and ’90s – with such cuts as “I’ve Got a Rock and Roll Heart,” “Forever Man,” “It’s in the Way That You Use It,” “Tears In Heaven,” and “Change the World.” The studio disc also reintroduces some tracks that casual fans might have overlooked such as “Revolution” and the excellent and rousing duet with B.B. King on “Riding with the King,” as well as his collaboration with the late J.J. Cale on “Anyway the Wind Blows” and his rendition of Cale’s “Call Me the Breeze.” The live disc portion features performances of Clapton’s well-known earlier material spanning Cream, Derek and the Dominoes and Blind Faith (For the studio versions of his work with those bands during his tenure with Polydor, The Cream of Clapton and Complete Clapton are highly recommended along with the superb Crossroads boxed set). Rather than just merely rehashing the studio renditions, Clapton reworks some of the classic material onstage – most notably “Layla” from the Grammy-winning Unplugged blockbuster; an extended version of “Wonderful Tonight” ; and his recent reunion with his former Blind Faith mate Steve Winwood on “Presence of the Lord” – as well as blues (“Hoochie Coochie Man”) and pop (“Over the Rainbow”). 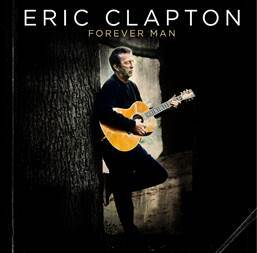 While perhaps not the most definitive compilation of E.C.’s music, Forever Man still offers a broad and satisfying overview of the legend’s famous work in its studio and live incarnations.